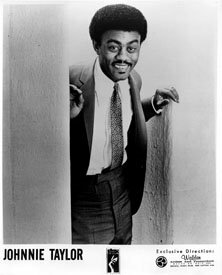 Johnnie Taylor spent his early childhood in West Memphis, Arkansas, just across the river from the big town. He moved with his Grandmother to Kansas City in the late forties and was singing with local Gospel quartet The Melody Kings by the time he reached his teens. 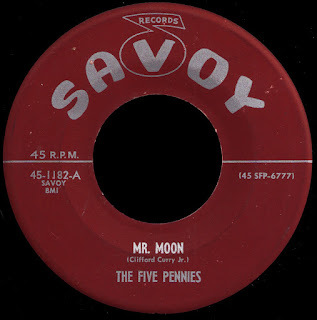 Relocating further north to Chicago in the early fifties, he began singing R&B with The Five Echoes, recording for the Sabre and Vee-Jay labels in 1954. When Sam Cooke was recruited by The Soul Stirrers in 1951, The Highway QCs were left without a lead singer. 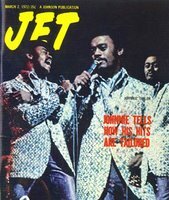 Although they kind of fell apart after that, they had regrouped by early 1955 and persuaded Johnnie to leave R&B and come sing Gospel with them. Sam heard about the cocky new lead that 'sounded just like him', and decided to check it out. He was impressed with Johnnie's talent (and his whole 'dig me' attitude), and began showing up at their rehearsals. He encouraged them to work on Somewhere To Lay My Head, and they recorded it for Vee-Jay in May of 1955 with Johnnie Taylor on lead vocal. Despite the fact that The Sensational Nightingales had already released a version of the song earlier in the year, it became a bona-fide Gospel hit that summer for the QCs. Cooke, of course, would leave The Soul Stirrers the following year, and launch his own pop career on the small west coast Keen label before being picked up by RCA. 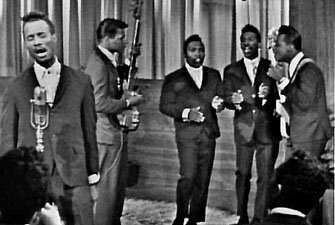 Consequently, The Soul Stirrers were once again in the market for a lead singer, and convinced Johnnie to leave the Highway QCs behind and join up with them in 1957. 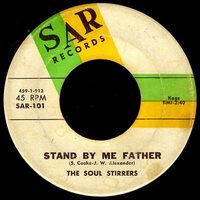 When they lost their contract with Specialty Records in 1958, the Stirrers signed with Sam's new SAR label, with Stand By Me Father being the company's first release in 1959 (for more on this whole period, please visit holy ghost). 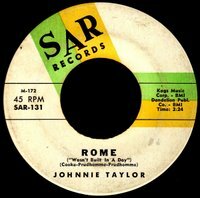 Taylor would leave The Soul Stirrers in 1960, and return to singing R&B as a solo artist for SAR and its subsidiary Derby beginning in 1961 (please check out the Rome (Wasn't Built In A Day) post over on The A Side for more information about his time with SAR). 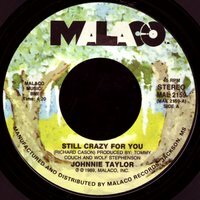 After Cooke was killed in late 1964, his record labels ceased to exist, and Johnnie was left without a recording contract in 1965. "I was living in Kansas City," he said, "...I got to St. Louis and I decided I'd toss up a dime. I said, 'Should I go towards Detroit for Motown or should I take the southern route to Stax?' Stax won out." 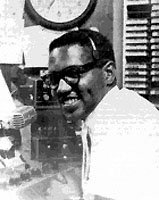 Al Bell had made a name for himself in Memphis as the new suave and sophisticated voice of R&B as a dee-jay on WLOK. He went on to greener pastures in Washington DC, and introduced the city to authentic Southern Soul on WUST in the early sixties. Jim Stewart brought him back to Memphis in 1965 as their first full-time promotion man. Bell immediately set about his plans for improving the label, and bringing it 'up to date'. Under his direction, the company began to produce quality LPs as well as singles and, due to his connections in radio, had more top ten hits in his first year at the company than they ever had before. 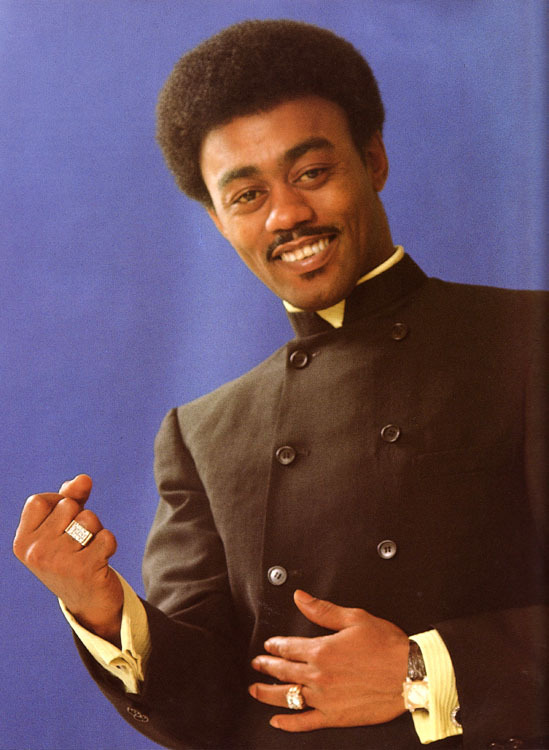 He was eager to expand their roster of artists, and so was more than happy to sign Johnnie Taylor to a contract in January of 1966. His first Stax release, I Had a Dream, was an excellent blues vehicle that was written and produced for him by Isaac Hayes and David Porter. It cracked the top 20 R&B, and set the tone for his Stax releases for the next couple of years. This period, with his records being produced by either Hayes and Porter or Al Jackson Jr. and Booker T, generated some of Johnnie's best sides ever. 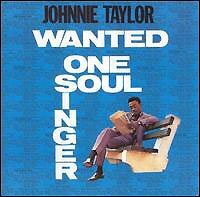 His first Stax LP, Wanted: One Soul Singer is simply a 'must-have'. In December of 1967, Johnnie was a pallbearer at Otis Redding's funeral, and sang I'll Be Standing By accompanied by Booker T on the organ. 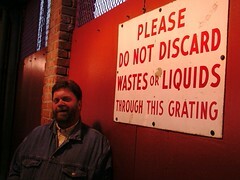 Little did he know he was about to take Otis' place as Stax's best known artist. Don Davis was a Detroit guitar player that had worked on some early Motown material before turning to production. 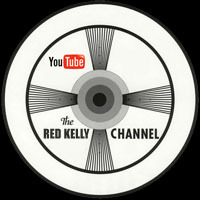 He was involved with several Detroit labels (like Thelma and Revillot) before starting up his own Groovesville imprint. A song he produced for the label, Baby Please Come Back Home, was an R&B top ten hit for J.J. Barnes in May of 1967. Al Bell had this idea of combining the Memphis and Detroit sounds, and co-produced a record with Davis on Carla Thomas called Pick Up The Pieces. It would break into the top 20 in early 1968, and basically reinforce the idea that he was on the right track. Bell decided to bring Davis to Stax, and hired him as a producer in September of 1968, a decision that was none too popular with the rest of the gang down on McLemore Avenue. When Homer Banks brought a song he had written (with his 'We Three' partners Raymond Jackson and Bettye Crutcher) to the 'Big 6' production pool (Booker T & the MGs, Isaac Hayes, and David Porter) at Stax it was summarily dismissed. He then brought it to Don Davis, essentially going behind the other's backs. 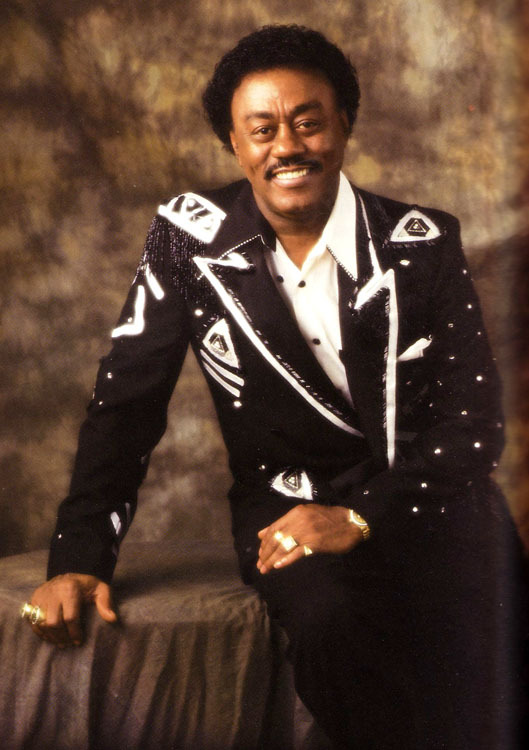 Davis loved it, and prevailed upon Al Bell to let him cut it on Johnnie Taylor. The whole rest of the team hated it (including Taylor, who called it "that boogity-boogity song"), but Bell basically forced them to give it a shot. When Who's Making Love was released in October of 1968, it broke all of Stax's previous sales records and spent an unprecedented 3 weeks at #1 R&B, while climbing to #5 on the pop charts as well. 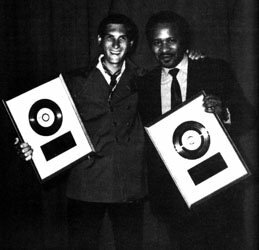 The record actually features both Davis and Steve Cropper (shown here with the Gold Records they earned for the single) on guitar, and it really does crank. It was the first time that a Stax singer overdubbed his vocals to a pre-recorded backing track (a Davis innovation) and, in so many ways, it just changed everything. On the basis of the success of Who's Making Love, Bell promoted Davis to 'Vice President in Charge of Production'. The Big 6 went ballistic, with Isaac Hayes actually closing down the studio, and clearing everyone out at gunpoint! Al Bell and Jim Stewart scrambled, and decided to make them ALL vice presidents, a title which now essentially meant nothing. Noses were out of joint, with Booker T (who many thought should have been given the position) refusing to ever play a note for Davis, and leaving the company in late 1969 (Steve Cropper would follow in 1971). Carla Thomas, I'm sure, summed up all of their feelings when she said "He should have stayed in Detroit!" 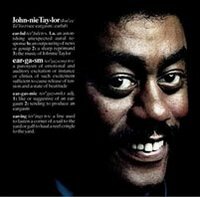 Johnnie Taylor, meanwhile, was thrilled to have Davis as his producer, and was just knocking 'em dead. 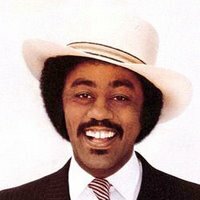 He followed Who's Making Love with an unparalleled string (for Stax artists anyway) of eight consecutive top ten hits, including gems like Take Care Of Your Homework and Jody's Got Your Girl And Gone. He was, quite simply, 'on top'. According to Rob Bowman's excellent Soulsville USA, Don Davis had decided to steer clear of the Stax studio entirely at this point, and was recording the basic tracks for Johnnie's records at Muscle Shoals, with the addition of the great Eddie Hinton on guitar. Today's really cool B side (the flip of 1971 top ten hit Hijackin' Love) also features The Dramatics (who had just waxed their #3 smash Whatcha See Is Whatcha Get for Volt) on background vocals. 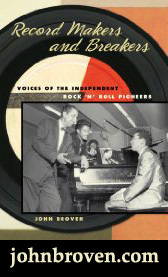 It gives the record this whole Gospel dimension, I think, and you can hear Johnny returning to his Sam Cooke roots... I love that little 'yodel' thing, man. He's really testifying there at the end, ain't he? 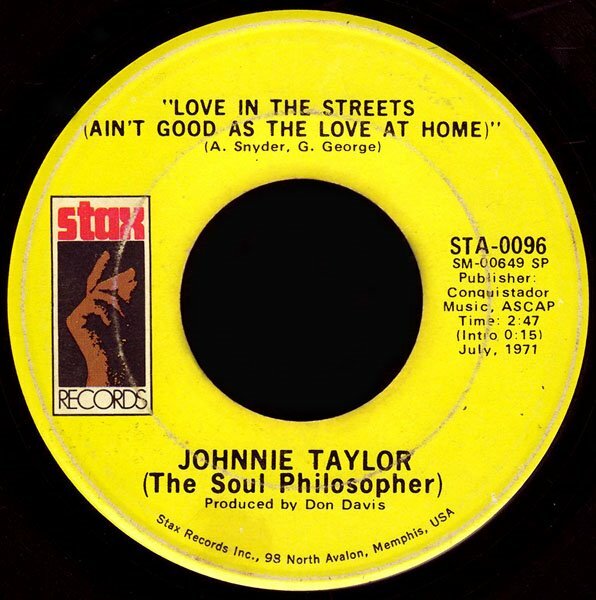 Johnnie Taylor continued to chart regularly for Stax, with huge hits like I Believe In You (You Believe In Me), Cheaper To Keep Her, and We're Getting Careless With Our Love dominating the airwaves right up until the company collapsed under its own weight in 1975. Wasting no time, Johnnie signed with CBS in August of that year, and brought Don Davis with him. 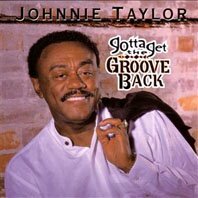 When Columbia Records released Eargasm in early 1976, it was obvious that Johnnie Taylor was, once again, in the right place at the right time. The first single from the album, Disco Lady (written by Davis and Harvey Scales), was an absolute monster. It spent a month at #1 on the pop charts (six weeks R&B), on its way to becoming the FIRST "platinum" record EVER, in any genre. Talk about your big hits! The next single pulled from the album (released the same day as Ted Taylor's version on Alarm), was the phenomenal Somebody's Gettin' It, which went to #5. Love Is Better In The A.M. did even better the following year, and Johnnie was on a roll. 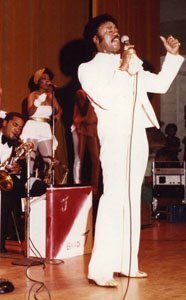 By the end of the decade, however, the whole 'death to disco' backlash took its toll on Johnnie (now understandably viewed as a disco mainstay), and CBS declined to renew his contract in 1981. A short-lived stint with the Beverly Glen label would produce an album, Just Ain't Good Enough, in 1982, and a few singles pulled from the album were released, with What About My Love breaking back into the top 40 R&B. Johnnie had lived in Dallas for years, and when fellow Texas soul man Z.Z. Hill died suddenly in 1984, he was called upon to sing at his funeral. 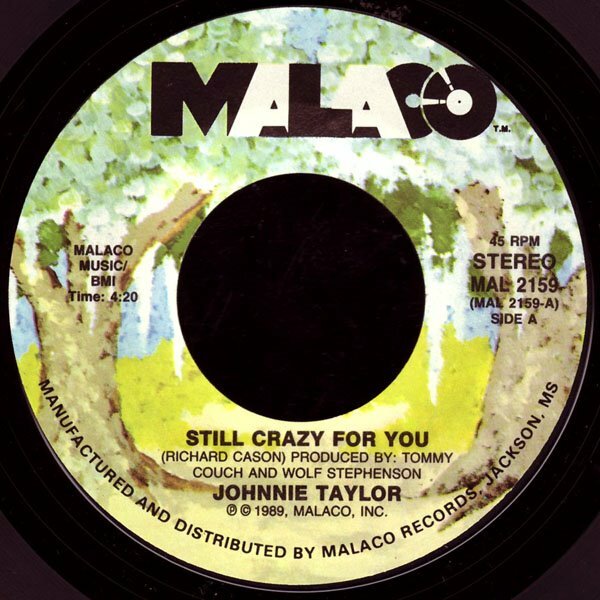 When Malaco Records' Tommy Couch heard him, he asked Dave Clark to convince him to sign with them. Just as with Otis Redding 17 years earlier, Johnnie was about to replace Z.Z. as his new label's biggest selling artist. He had found a home, and would go on to release one solid album after another. Although he hated being pigeonholed as a 'blues' artist, it kinda came with the territory at Malaco, and he dealt with it. I saw him perform in New York as part of the late lamented Benson & Hedges Blues Festival sometime in the late eighties, and he was fantastic. The 'blues purists' in the audience weren't quite sure what to make of his 'disco' outfit, and his big band, but when he sang songs like Little Bluebird and I Got To Love Somebody's Baby he just brought down the house, man. His 1996 album Good Love topped Billboard's Blues chart that year, and a hit single from the album, Last Two Dollars, helped to make it Malaco's biggest selling album ever. On May 31, 2000 Johnny Taylor was felled by a massive heart attack at his home outside of Dallas. His funeral at the Good Street Baptist Church was attended by over 7000 people, among them soul legends like Aretha Franklin, Al Green and Bobby Womack. People filed silently past his casket for hours. Perhaps Tommy Couch put it best when he hailed him as "the last of the great soul men". So, what's with the "Triple Play"? I've had 'Rome' for a while, but I was waiting till I got a copy of that first SAR release (and a page to put it on) before I tackled Johnnie's story. What a neat triple treat you brought us this time. I wonder if there's an appendix somewhere..? While you're there, try "innercalm" for 200 clips.